The Larger the Number the Smaller the Opening? Each f-stop has twice the area of the next full f-stop. So, f/8 lets in twice the light of f/11 and half the light of f/5.6. The number is actually a mathematical statement that says how large the aperture is in comparison to the lens. I.e., if you have a lens with a diameter of 40 mm, then f/2 would mean that the diameter of the aperture is 20 mm and f/4 would mean that the diameter of the aperture is 10 mm. Three simple reasons: depth of field, light, and motion. Apertures settings affect these items in multiple ways. 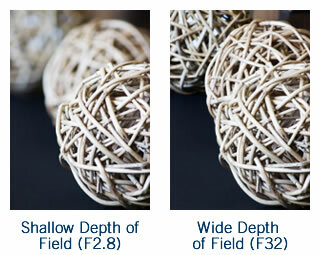 Depth of field is the zone of acceptably sharp focus in a photograph, as exampled by the image to the right. A F2.8 aperture will have a small depth of field relative to a F16 aperture (which will have a much larger depth of field). The combination of light and aperture determine shutter speed, which affects how motion is displayed in photographs. An aperture of F2.8 will allow a lot more light into your camera than an aperture of F16. So in order to get a correct exposure, the shutter will be open less time at an aperture of F2.8 than if the aperture is F16. This means that motion is more likely to be displayed at an aperture of F16 than at an aperture of F2.8.